Preheat the oven to 275°F. Whisk the egg whites on medium speed using an electric mixer fitted with a whip attachment. When the foam no longer gains volume and starts to slide from the sides of the bowl, increase the speed to maximum. Add the granulated sugar and continue whipping until it forms stiff peaks. Add the cocoa powder, icing sugar, almond powder, and Caramel Dust. Gently fold in using a rubber spatula. Fill a piping bag with the meringue and pipe 1 3/4 inch rounds onto a silicon mat or paper. Bake for 40 minutes in the preheated oven. Remove from the oven and cool on the tray. Store in an airtight container. Combine the sugar, corn syrup, and water in a saucepan. Cook over high heat until the mixture is caramel in color. Remove from the heat. Add the butter and mix until completely incorporated. Pour the caramel onto a silicon mat and let cool at room temperature until completely hard. Break the caramel into small shards. Grind the shards to a fine powder in a food processor. Store in an airtight container. Bring the milk, whipping cream, and dried lavender to a boil in a saucepan. Remove from the heat, cover with a tight-fitting lid, and allow to infuse for 30 minutes. Whisk the yolks and sugar in a bowl. Strain the milk infusion into the yolk/sugar mixture and discard the dried lavender. Whisk until combined. Cook the yolk/milk mixture over a double boiler, continuously whisking, until it begins to foam and thicken (or reaches 185° F). Remove from the heat and whisk in the Gelatin Mix. Whisk in the chocolate until well combined. Transfer into a container fitted with a lid and let it set in the refrigerator for at least 2 hours (overnight is best). Combine the gelatin and water in a microwavable container. Allow the gelatin to bloom for 5 minutes. Heat the mixture in the microwave for 20 to 30 seconds, then let it set at room temperature. Cover the container with a lid and store in the refrigerator for up to 1 week. Place the chocolate and butter into a tall and narrow container. Bring the apricot purée, whipping cream, and corn syrup to a boil in a saucepan, then pour over the chocolate. Blend with an immersion blender until well combined. Let it cool until the ganache has the consistency of soft butter. This recipe makes more than required; the excess can be stored in the refrigerator for up to 2 weeks. Combine the Apricot Ganache and Pastry Cream in a bowl. Place the bowl over a double boiler and whisk until the mixture is smooth and warm (98° F). Bring the water and lavender to a boil in a saucepan. Remove from the heat and cover with a tight-fitting lid. Allow the mixture to infuse for at least 1 hr. Strain the mixture and discard the dried lavender. Bring the infusion back to a boil, then remove from the heat. Add the apricots to the pot and cover with a tight-fitting lid. Place the pot in the refrigerator for 4 to 6 hours (overnight is best). Spread a 1/8 inch thick layer of tempered chocolate onto a baking tray lined with silicon paper. Before the chocolate starts to set, cut 3 x 1 inch rectangular shapes with a sharp knife. Cover with another sheet of silicon paper or plastic wrap, turn upside down on a cutting board or baking tray (to prevent warping). Let this sit until the chocolate hardens. Pipe or spoon some Chocolate Lavender Cream into the center of half the meringues. 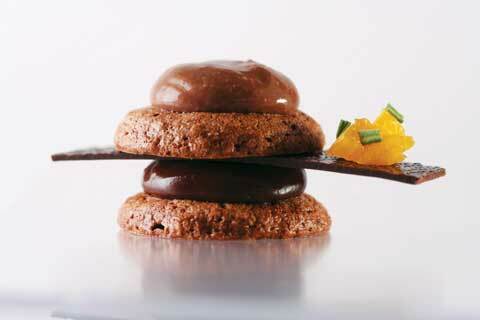 Pipe or spoon some Chocolate Apricot Emulsion into the center of the remaining meringues. Sandwich a chocolate rectangle between one of the Chocolate Lavender meringue and one of the Chocolate Apricot meringues, leaving at least 1 inch of the chocolate extending on one side. Drain the Dried Apricots on a paper towel and place a small amount on the edge of the chocolate. Decorate with some fresh lavender. If prepared in advance, store in the refrigerator for up to 2 hours until ready to serve.